A blog exploring functional programming and Swift. Today we are open sourcing Validated, a tiny functional Swift library for handling multiple errors: functionality that you don’t get from throwing functions and the Result type. Error handling in Swift is done through a first-class language feature known as throw and catch. It allows you to express the concept of an operation that can fail and provide a data value to represent what went wrong. It is designed to be a short-circuiting mechanism, which means the moment you throw an error, the execution of your function is immediately stopped. Having first-class support for error handling in Swift is nice, but its short-circuiting behavior can be limiting. There are times that we may want to throw multiple times in a function, and have all of those errors accumulated. Here we’ve combined a few throwing functions into a single throwing function that may return a User. It’s important to note that each of these validations are independent of each other: we don’t need to validate one field in order to validate the next field. This is unfortunate because it creates a subpar user experience. The user can submit a form with invalid data, but then only be notified of the first error we discover. They will have no choice but to fix that one error and submit again to find out if there is anything else wrong with their data. So, how do we create a User value from the form data and these functions? Previously we had to create a custom validateUser function to accomodate for the throwing functions, but the Validated library comes with a special function that allows us to instantiate any data type from validated values. It’s our old friend zip(with:)! 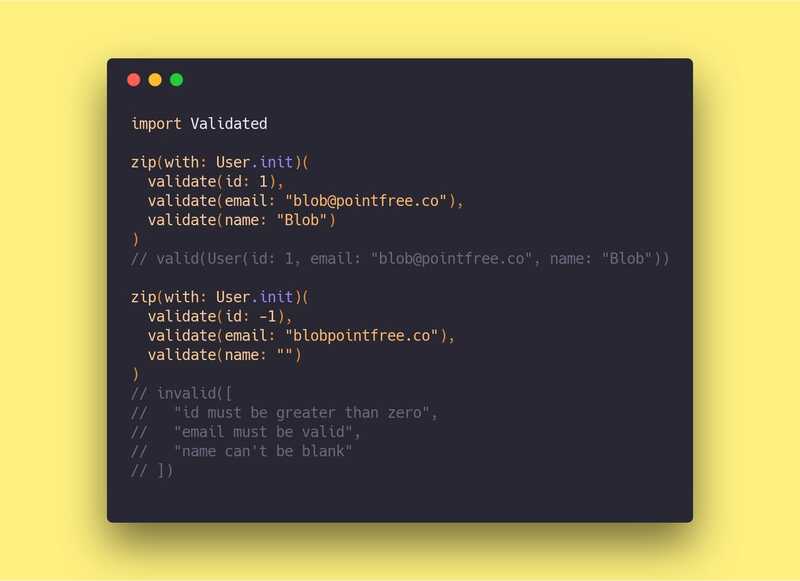 You can think of zip(with: User.init) as a lifting the User initializer up into the world of validated values. Here we’ve provided valid values for the fields of the initializer, and so we get a valid user out the other side. That’s about all there is to Validated! It’s a tiny API that should be familiar to you if you’ve ever used the Result type, and it provides tangible benefits over the short-circuiting nature of Result and throws. It can enhance your error handling today, no need to wait for Swift to catch up! If you want to give it a spin, check out our open source repo. 👋 Hey there! If you got this far, then you must have enjoyed this post. You may want to also check out Point-Free, a video series on functional programming and Swift.